Red Heart With Love Yarn, approx. 150-175 yds. Continue to repeat from **to** for a total of 48 rows. 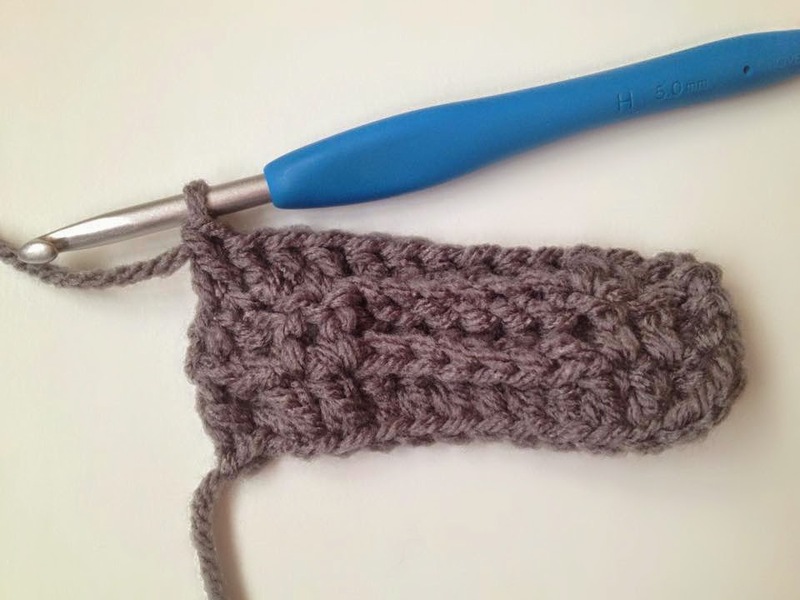 After row 48 fold the ear warmer in half with the right sides facing each other so you can slip stitch row 1 to row 48. Row 1: Ch 1 and proceed to sl st across making sure you are working through all 4 loops as you go. 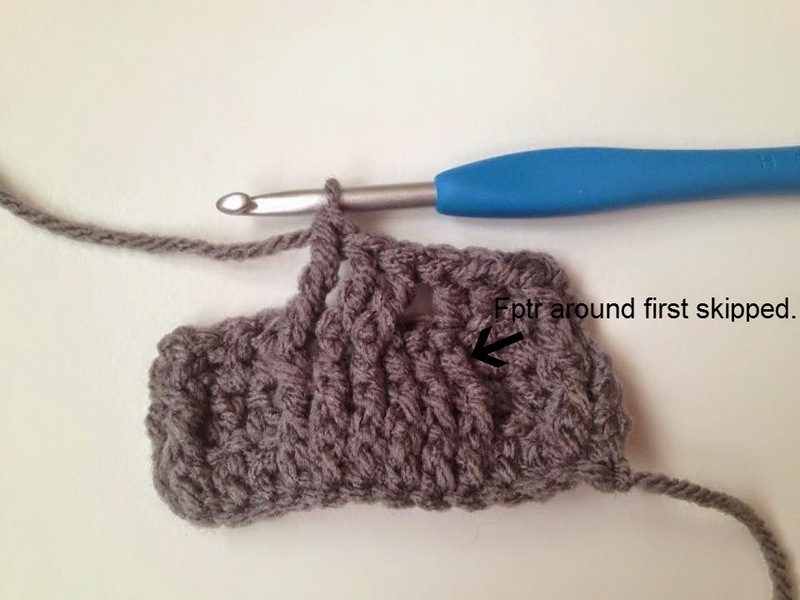 After you have slip stitched across turn the ear warmer right side out and ch 1. Now you will be working a row of sc's around the edge over the dc's & ch 2's. Begin by working 2 sc into the first space, work 1 sc into the next space. *2 sc over next, 1 sc over next. * Repeat *to* around. Join with a sl st. You should end with 72 sc. Your edge should look nice and straight now. 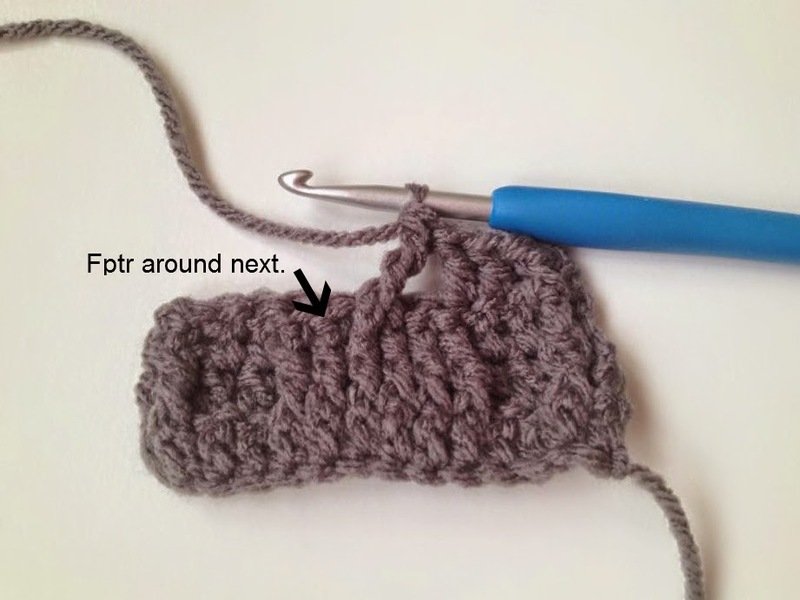 Next, join yarn to the opposite side of the ear warmer with a sl st and repeat rows 1 & 2. 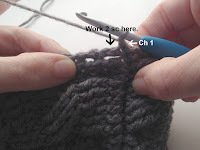 Row 1: Ch 15, dc in 3rd ch from hook and in each across. In the next row you will be working a bpdc around every fpdc from row 2 and you will dc in every dc from row 2. 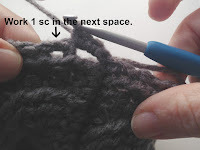 The next row is where most people who haven't crocheted cables yet get confused so I have taken lots of photos for this part of the tutorial. Sk 3, Fptr around next. Now fptr around 1st skipped. Your piece may look squished up but don't worry, it will all straighten out. Your next row is a repeat of row 3. 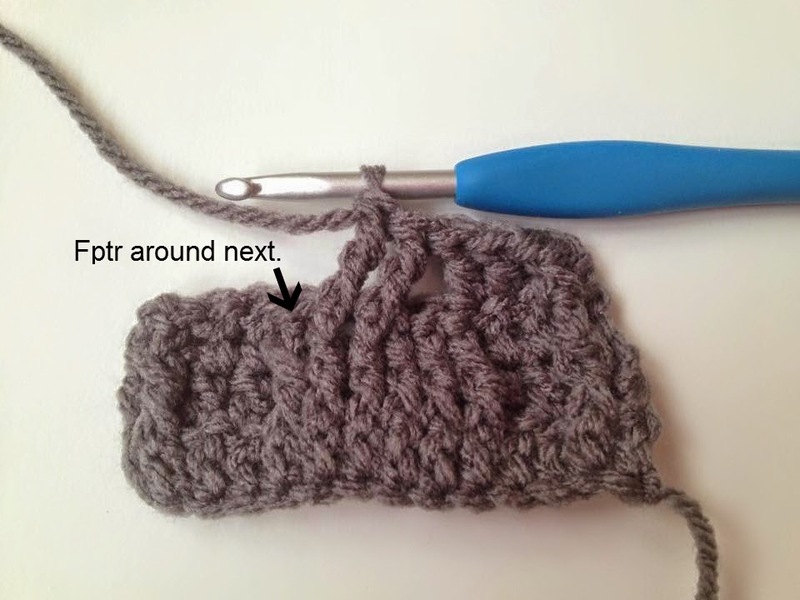 The rest of the pattern repeats the same four rows until you reach 48 rows. Great pattern Jenni! thankyou :) I have never done a cable stitch and you explained it so clearly! love it. Another question. Are we able to sell items made from this pattern with a note the pattern is designed by you? Thanks for the pattern...can't wait to give it a try! I made this tonight for my daughter. Fabulous pattern! Love the video tutorial. Thanks! Hello! 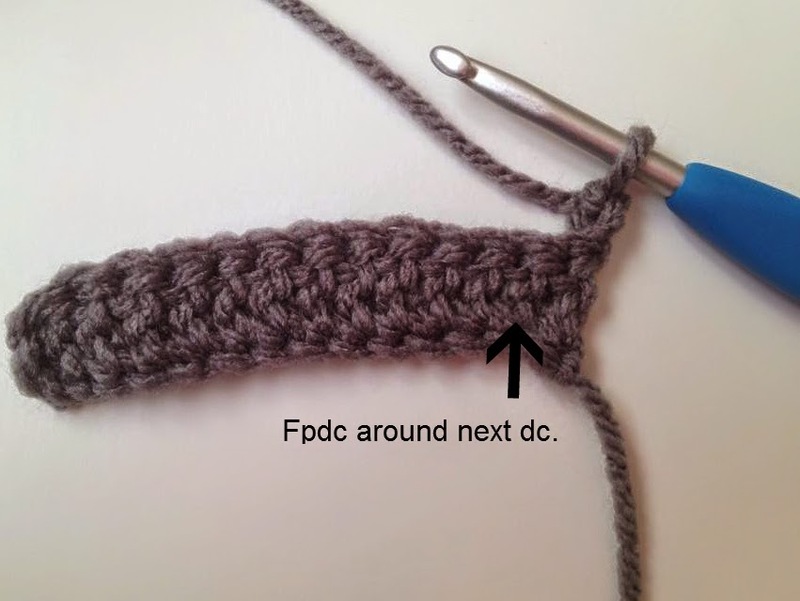 I am LOVING this pattern, I just have one question - When you start each row with a fpdc (or bpdc) do you do this around the outer-most post? or do you do it around the next one in? I have been doing it the second way I described and I don't think I am getting the same clean edge pattern you have. Thanks so much! I was almost ready to rip it out and start again! Yes, there is some gaping. 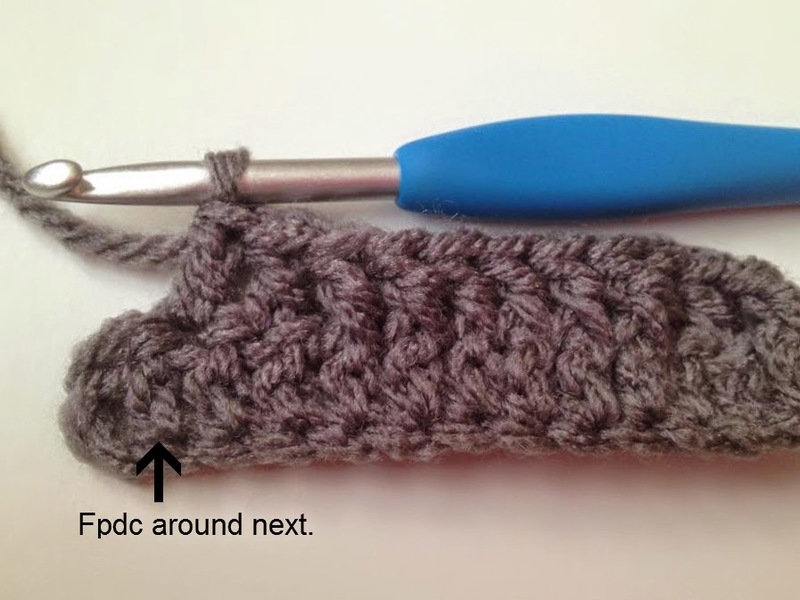 Great pattern, Are we able to sell our finished product giving you credit for the pattern? Sure, I don't mind and definitely appreciate design credit. Thanks for asking! I enjoyed making this. Thanks for the pattern! How wide is the headband? Thanks! It's about 4" wide when completed. HI, Could you please give me a gauge for this. I see that it is 4" wide, about how many rows to get to 4"? 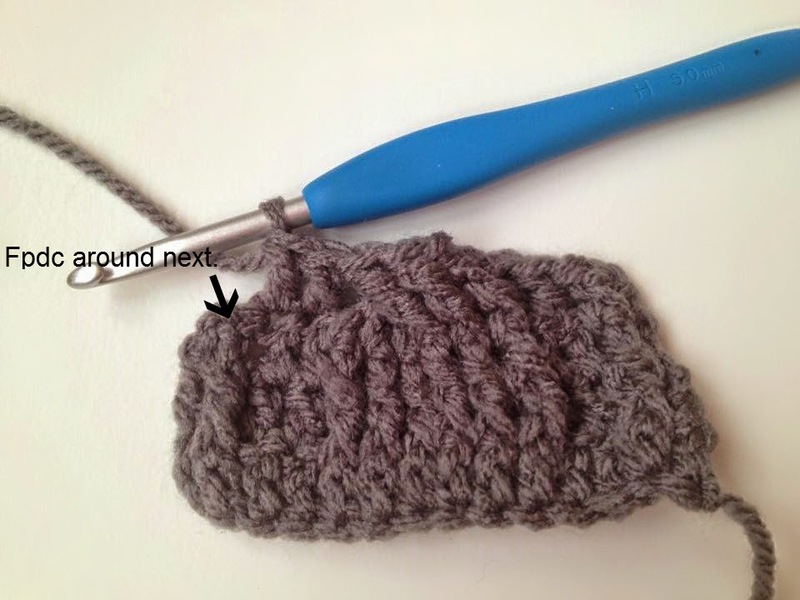 I want to make this with bulky yarn to match a car I made and don't want it to be too big. Than you! Love this design! Never mind, I just noticed that you have the gauge in the notes. thanks! Wonderfully written pattern! Very easy work up. Thank you so much for sharing! Love this pattern!! Easy to memorize!! Just wondering if you have adjustments available to fit a smaller head, like an 8 year old girl? Thanks for the beautiful pattern and your help!! I'm sorry, I have not made this in a smaller size. If you make this 2 rows shorter it would be roughly 1" smaller in circumference, fitting a 21" head. My 5 & 10 year old sons both have a head measurement of 21", hope this helps. 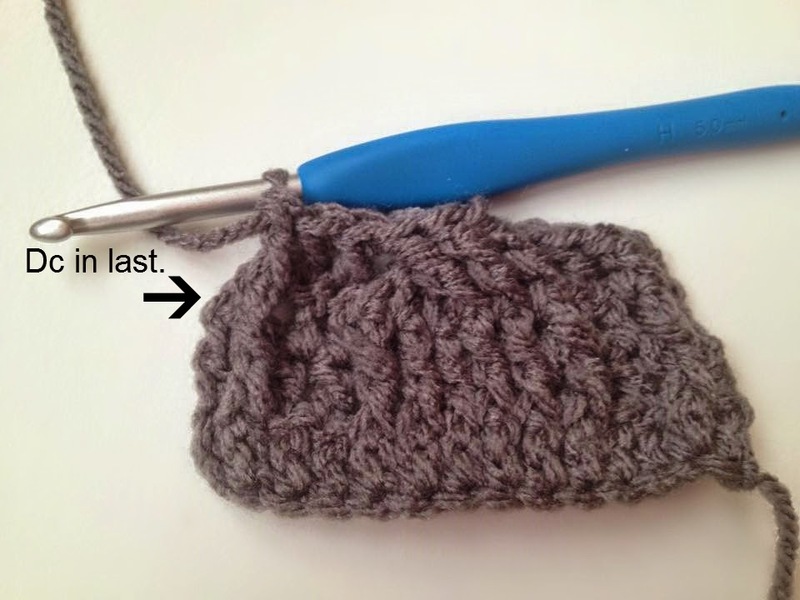 If/when I do make this in a smaller size I will be sure to let you know! Mmkay, that helps. Thank you!! Wow, Jenni, you're a gem! I can't believe all the time you spent on the pictorial and video of the instructions of your beautiful creation. Had it not been for the video, I'm afraid it would have taken me hours to figure this out, haha! 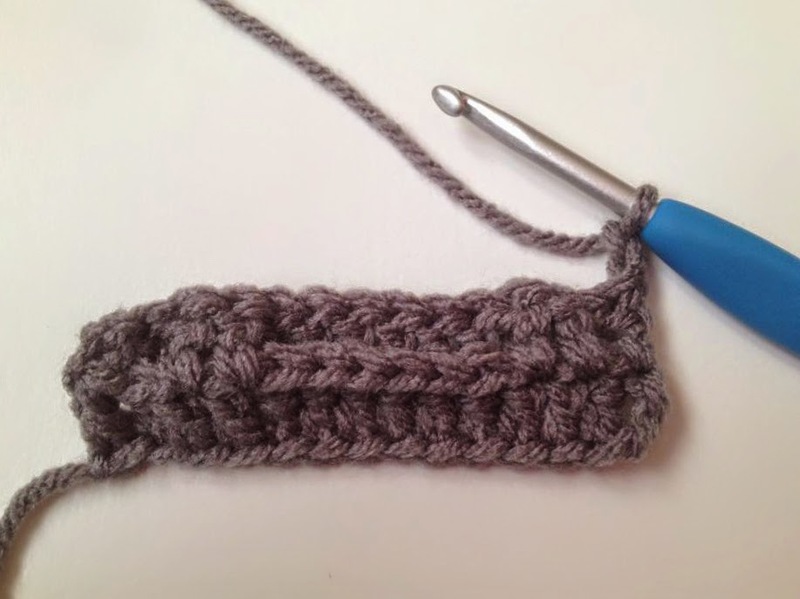 I've been crocheting for 35 years and have never seen a stitch like this. It's beautiful, thank-you! 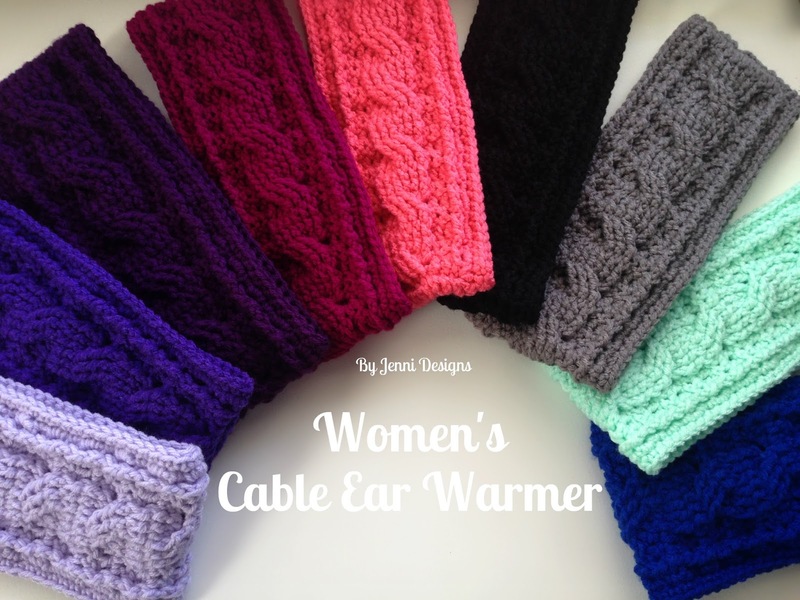 Of all the ear warmers my daughter and I looked at, this is the pattern that my daughter wanted. I'm making me one, as well. Again, I truly appreciate all your time and effort in sharing. Blessings to you! I would love if you shared it! Thanks so much for taking the time to leave a comment. I'm unsure on how to do the edging. I'm not sure where to put the SC. I also sl St after my 48 rows and fastened off, is that a problem? No, it's ok if you fastened off. You'll just need to re-join with a slip stitch, then ch 1. After chaining 1, sc into the same space. Then work 2 sc in the next space. *1 sc in the next, 2 sc in the next* Repeat around. 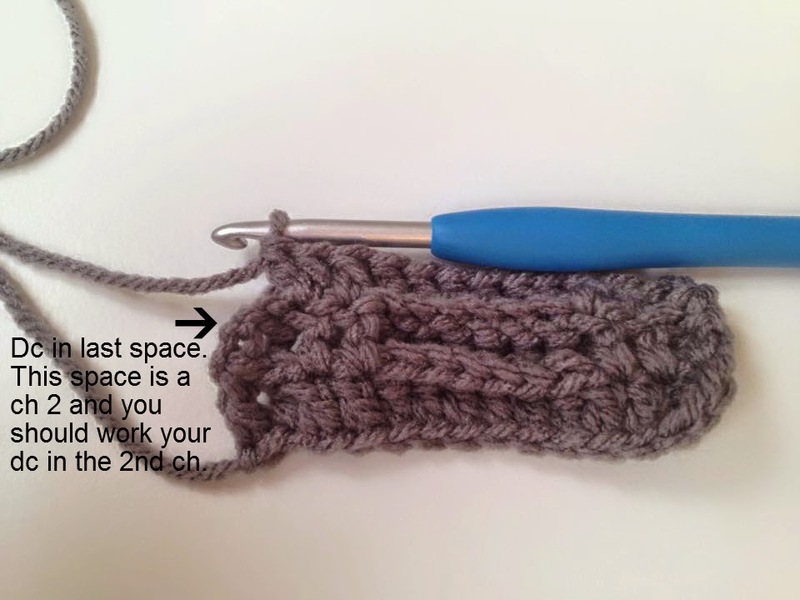 The "spaces" are your dc's and ch 2's that you are crocheting over. 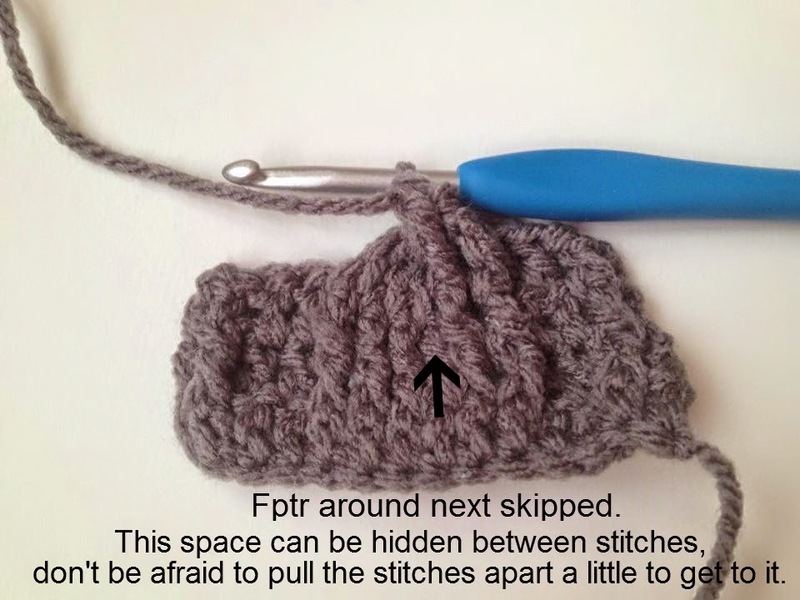 After you join, try the headband on your head to make sure it fits correct, then fasten off. Repeat on the other side. I hope this helps. Did you get a chance to put together a video for the edging? I'm stuck too. Hi! Looks like a great pattern!! I'm interested in making it a bit more narrow - more headband-ish than ear warmer. Can I cut back the original chain and go from there? Any tips would be appreciated. Good work! 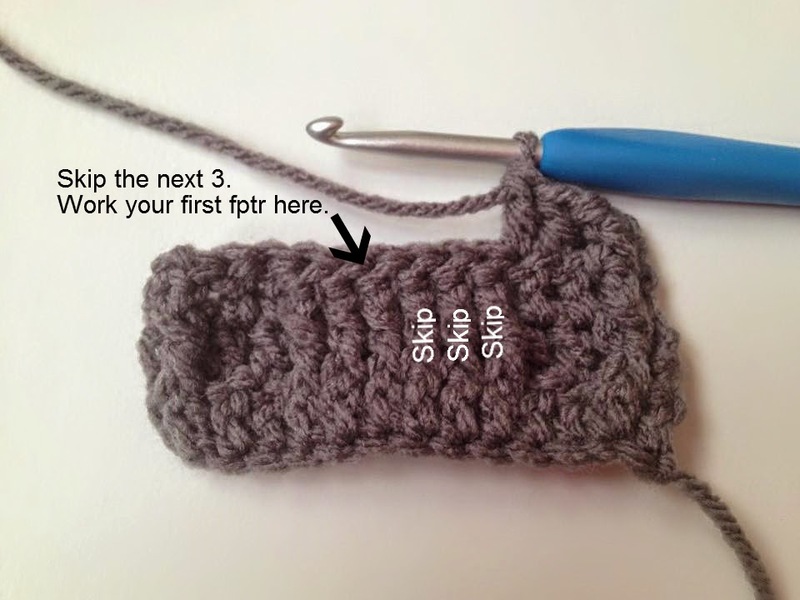 I love this pattern and being new to crochet I found the picture tutorial really helped. I have got a little stuck now with the edging though. Do you have any pictures to help with this Jenni or maybe a link to the video tutorial you mention please? I am so sorry, I haven't been keeping up with comments because things have been crazy here at home so I am just now seeing this. 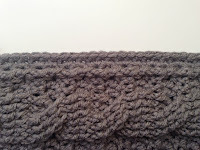 I do not have a video for the edging (yet). When you start working on the edge, you need to alternate *2 sc, 1 sc* working over the dc's & ch 2's that you previously made when you were working the rows back and forth. 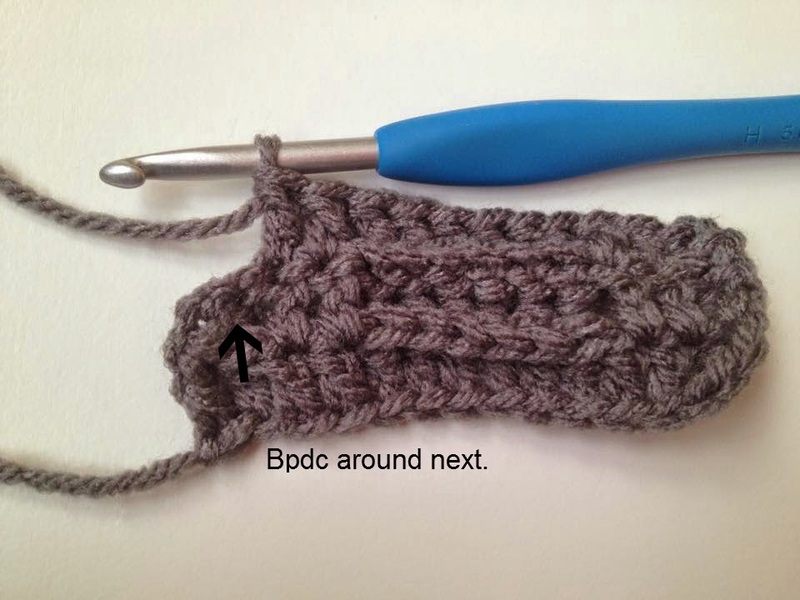 I will try and at least get a photo tutorial together for this portion of the pattern shortly. I apologize for the confusion! I LOVE this pattern. I've finished it and it looks really cute except my edging doesn't look the same as yours. It doesn't look bad but I like the way yours looks in the picture better. I must have done something wrong but I can't figure out what it is. 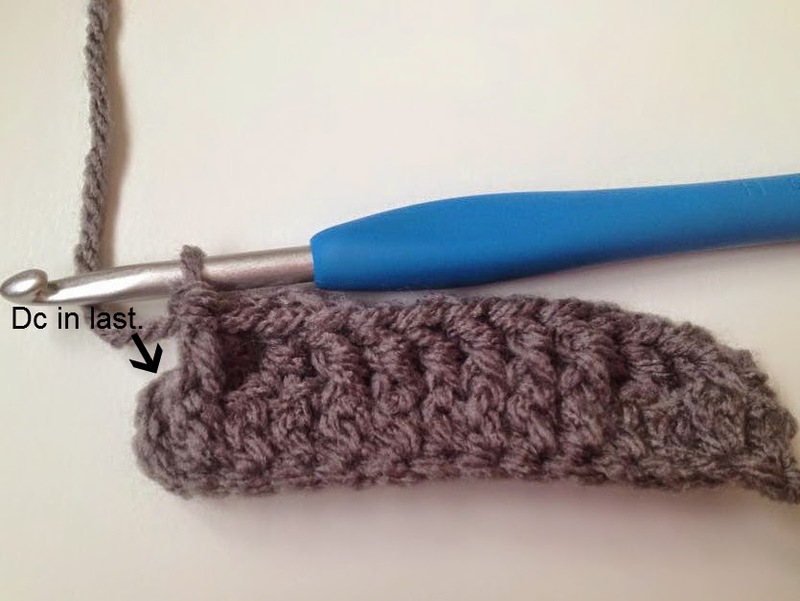 I was wondering if you ever made a video or photo tutorial of the edging. I would love to see it if you have one or if you make one. Dang! Everytime I get to row 5 I have trouble. 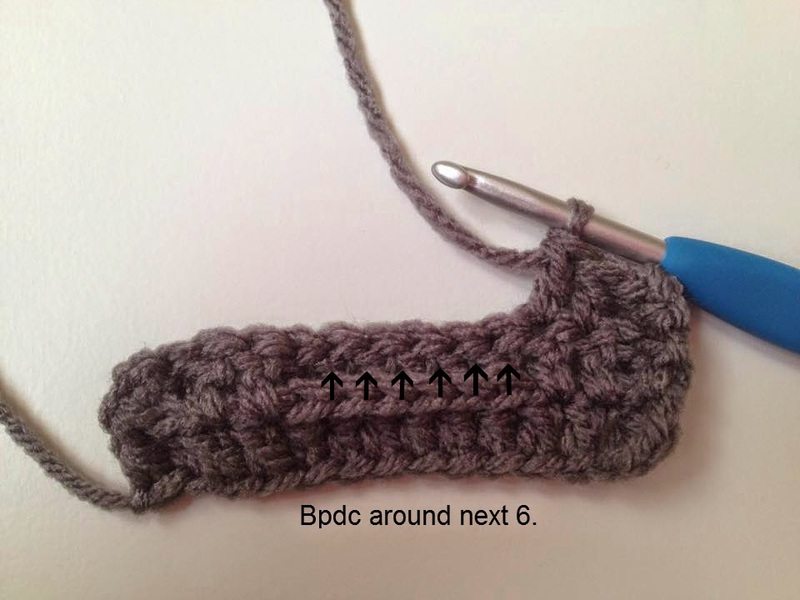 I am not sure where to put the BPDC because of row 4 there are like the 3 FPTC stacked on the other 3? Do I go down to row 3 or to do the BPDC? Hi Brit, I think I need to add this to the photo tutorial. 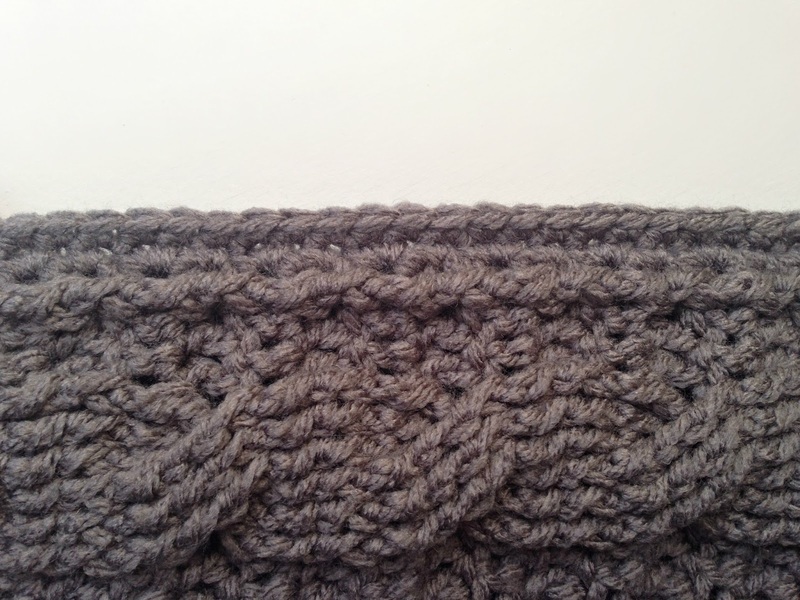 The only reason it's a little tricky is because the stitches are all smushed together until you complete row 5. Do not work the BPDC's below on row 3, they need to be worked on row 4. I will try and add to the tutorial in the next few days to hopefully clear up any confusion. I watched a crochet crowd video tutorial that showed it perfect. Just completed mine with a fuzzy metallic yarn. Turned out really nice. Great pattern! 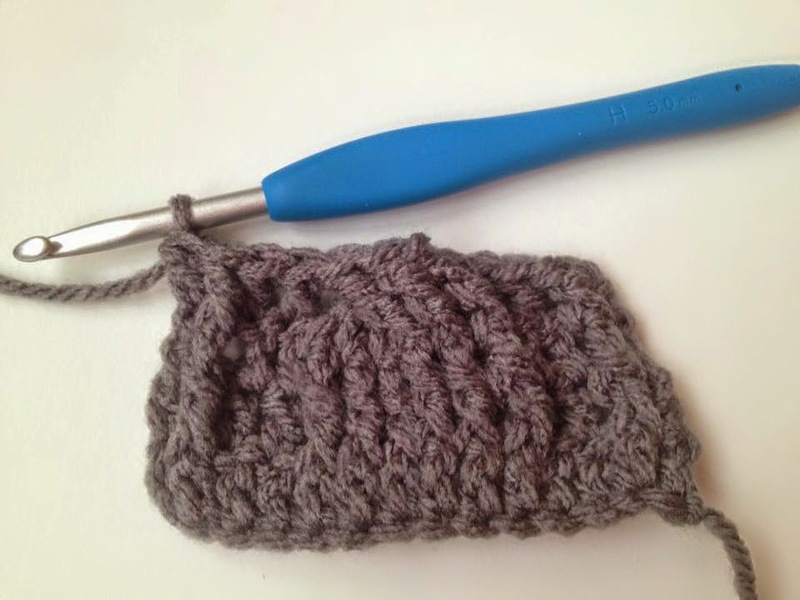 You'll find all the information about what you need listed under "Supplies", your hook size should be a size H.
Thanks for the lovely pattern, easy to follow. Whipped this one up last night, it was so fun I couldn't put it down! The written instructions were so great, I didn't even realize there were pictures until I scrolled down for the edging instructions! I see many, many more in my future and can't wait to apply the stitch to other projects now. I have these for myself in many, many colors so I get it ;) Thank you for the nice comment! I dont understand what to do when you have to skip 3 FPTC next, do you turn to go back to the skip 3? I get some kind of accordian effect and it is not flat. You do not turn, you will skip 3, work in the next 3 then go back to work in the skipped 3. It will look like an accordion but the piece will flatten itself out as you work the following rows. Love Love Love this pattern!!! It was soooo fun and easy to do once I got the hang of it. My daughter and daughter in law want one in several colors. 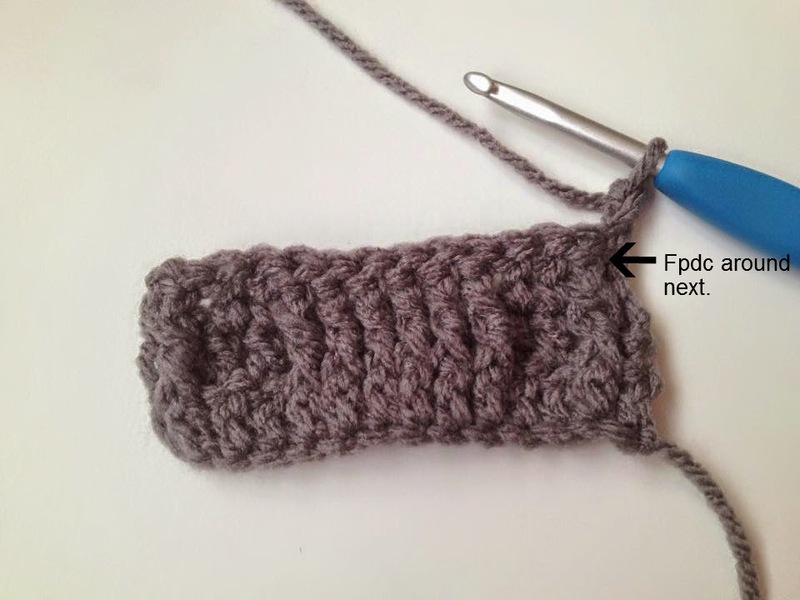 Thank you for sharing this awesome pattern for free!!! I noticed some people mention a video. I can't seem to find it. Help! You can give it a watch and see if it helps but which part are you having a hard time with? Maybe I can help. I found this through Pinterest and was worried they would be difficult because they look so intricate but you explain the procedure so well and make it so easy! I've made 2 just today and I know I will be making many more, for myself and for gifts. Thank you!!! Thank you so much for your comment Leilah! You are very welcome! I followed the pattern exactly. I used same yarn and hook. Mine came out HUGE! Any thoughts? 5 inches instead of 4. Very wide and a little big around also. 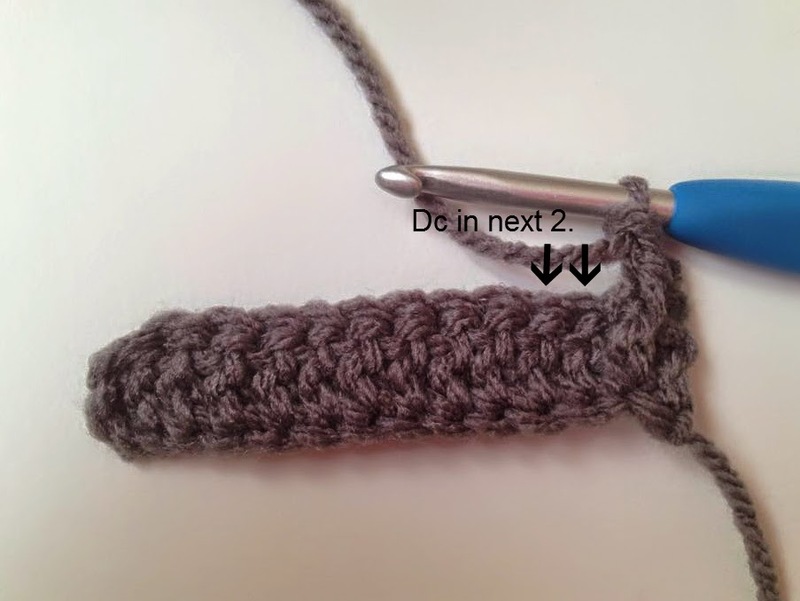 I crochet tightly so I listed the gauge in the pattern above for others to follow, it's possible you crochet looser than I do. Maybe try a size G hook instead? 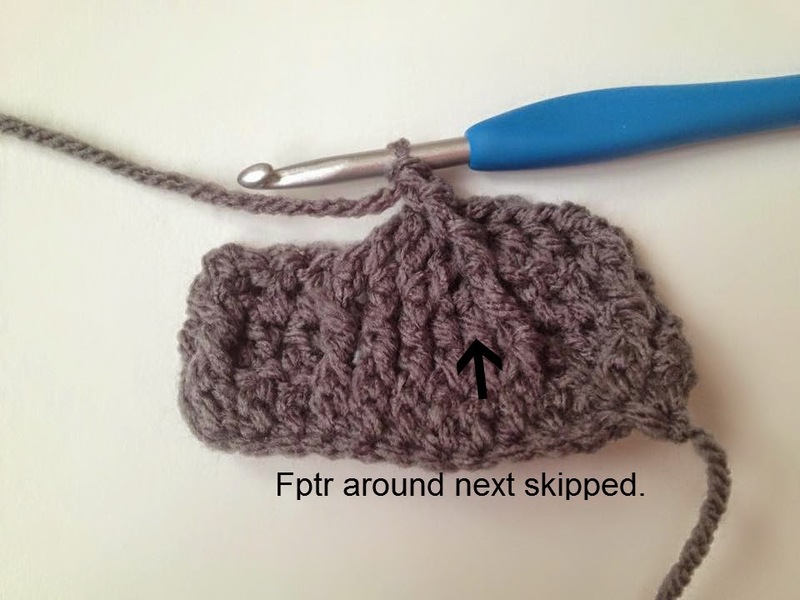 Hi Kaiseih, I do not have a video yet for this pattern. I will let you know when I do have one though. Maybe the tutorial can help? I'm having some trouble. The band would've been too big if I'd done the full 48 rows, so I stopped at 40. 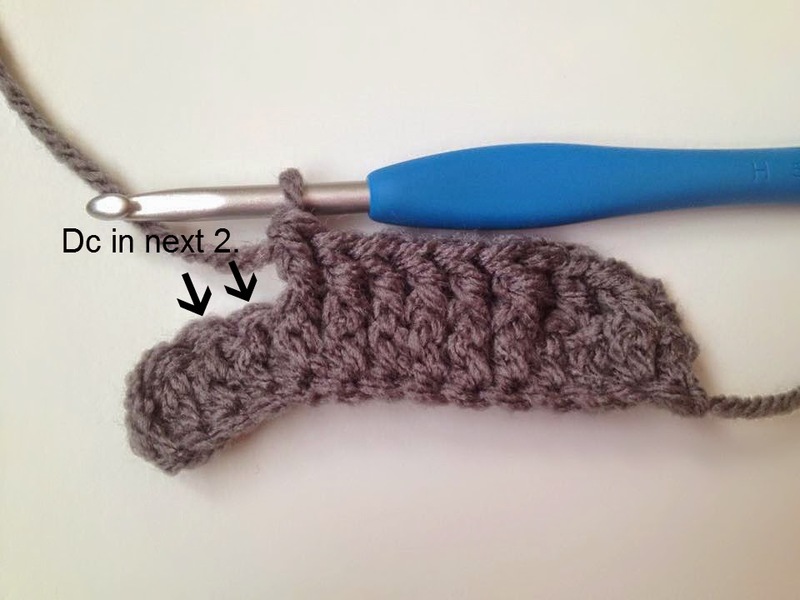 I sewed up the two ends and I seem to be having trouble with the edging. I have gone around with the sc in the ch space and 2 sc in the dc, but I reach 72 long before I'm near the end, even though I didn't complete the full 48. Any suggestions? By the way, I absolutely LOVE this cable thing - it makes it look similar to knitting (which I am no good at). Thanks! 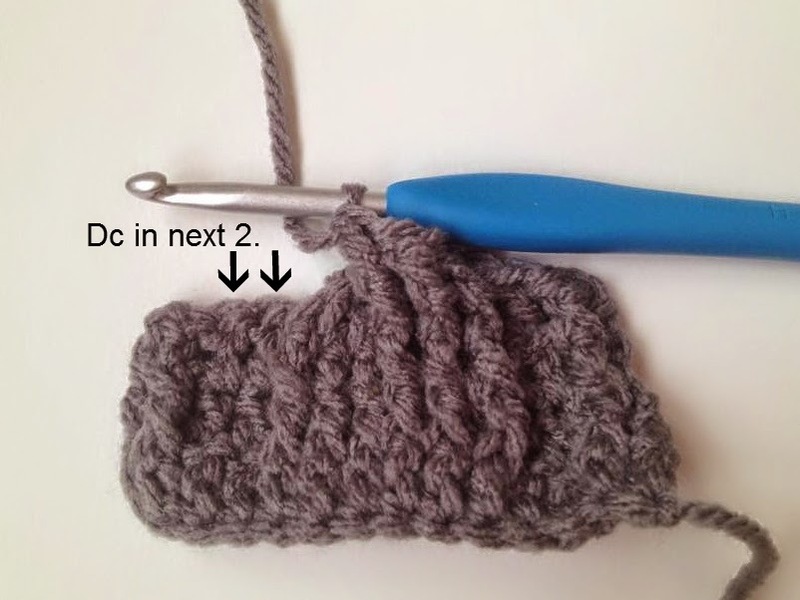 I'm guessing you crochet a tad looser than I do ;) Getting the 72 sc stitch count is not necessary, just work your sc's around and try the headband on. If it's too tight you know you need more sc's worked into the row or if it's too loose you'll need to remove some. I would think if you only needed 40 rows your sc count should be more like 60. I'm also not so great at knitting but looooove how anything knit looks! Thank you for your reply! I do tend to crochet less tight because arthritis hands have a hard time getting the needle in the hole, not to mention needing a magnifier. LOL I got done with it and it looks fine. I'm going to make more!!! Everyone is getting one for Christmas! Thank you so much for reply! You're welcome, I'm so glad it worked out! Happy Holidays! I'm not sure I've ever seen such complete and easy to understande directions - for an intricate procedure. THANK YOU for clear pictures/instructions! 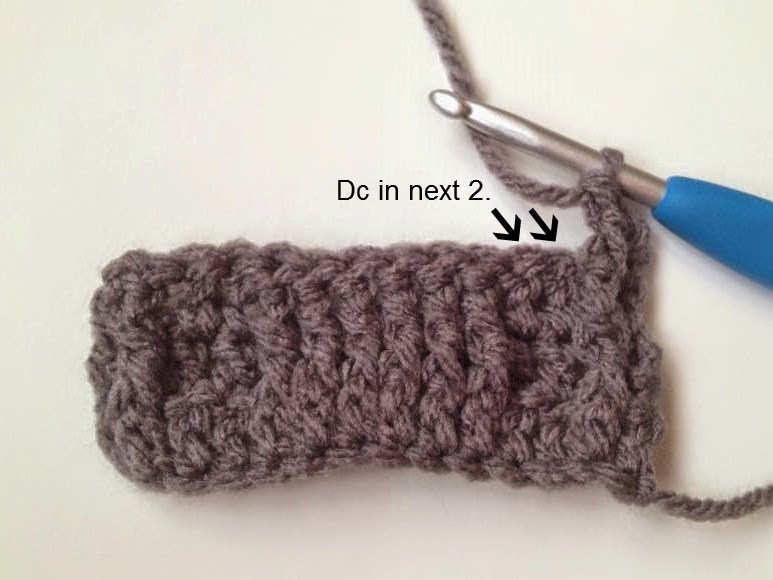 Making this right now, very easy pattern to follow but I can't seem to get my cables nice and crisp like your photos, any tips? Do you crochet on the loose side? 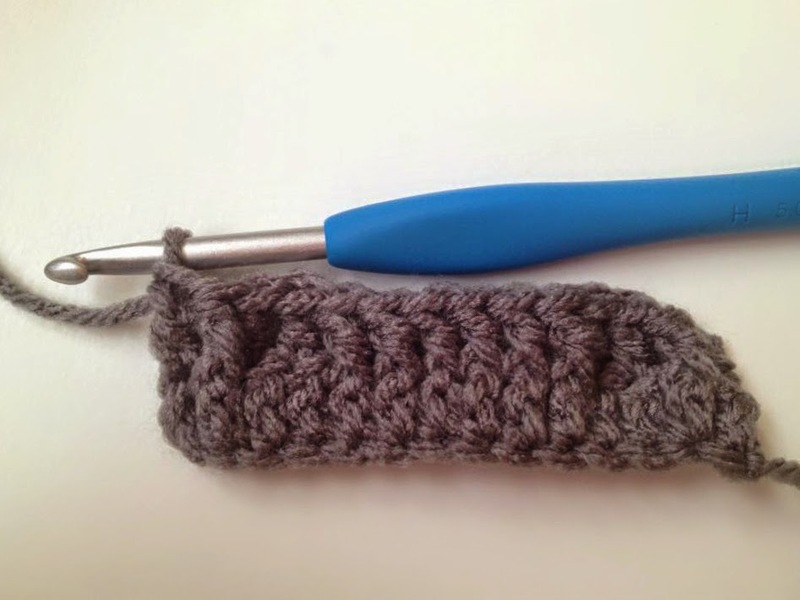 That could be it, I crochet very tightly. Yes, straight across. Bpdc in each as they come to you. I hope that makes sense, it's so hard to put into words! Hi! 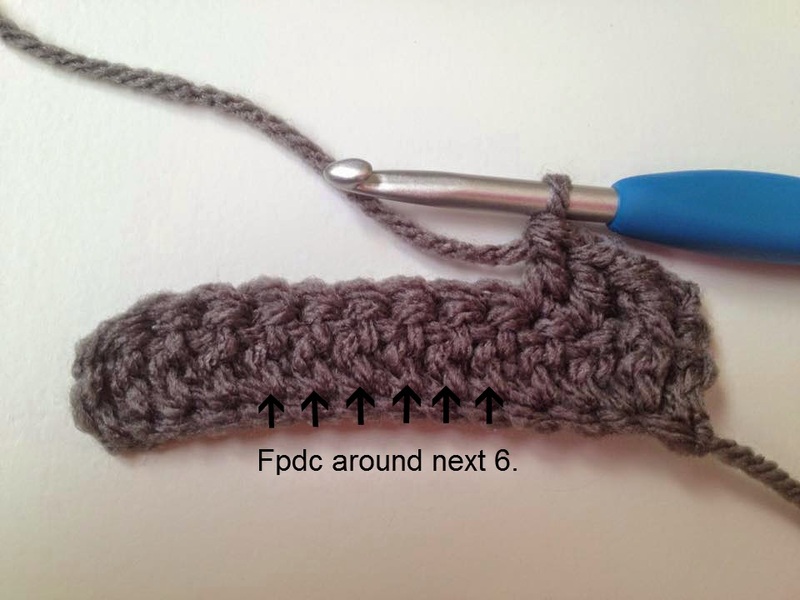 I'm not sure I understand the end of the pattern...am I supposed to crochet twice around the edge of the ear warmer so that there are two rows of single crochet around the edge? Thanks! Hello! 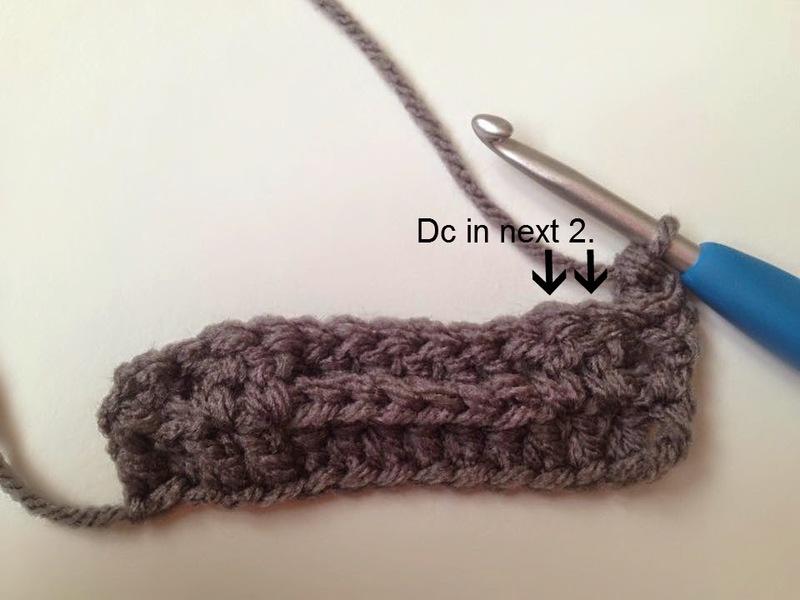 I have not made this yet for such a small size but I would suggest omitting a dc on each side of the cable and then at the end of the pattern when you work the edge, I would do one less row of sc's. You will also need to cut many rows near the end, I would definitely use her head as a guide to decide how many rows you need. You'll need to change "dc in next 2" in every row after to "dc in next". 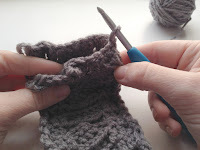 thanks a lot i will try it and let you know,,,, any idea if i use the same pattern but without the edging? will that be ok? just will reduce rows till i come up to 16" and follow the same...or i have to ch 13 at the beginning? You can give it a try without the edging, the edging really is just to clean up the appearance. I would chain 13 at the beginning, it may be too wide for her head otherwise but maybe not. You can make this as long as you like by continuing the repeat over and over, this will only give you one long strip. I suppose you could sew the edges of multiple together though! 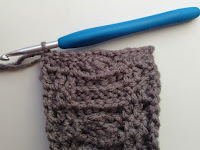 I've always wanted to create a cable blanket, I'll have to add it to the to-do list! I'm finding that there is a lot of gapping around my cables. ANy suggestions how to minimize that? 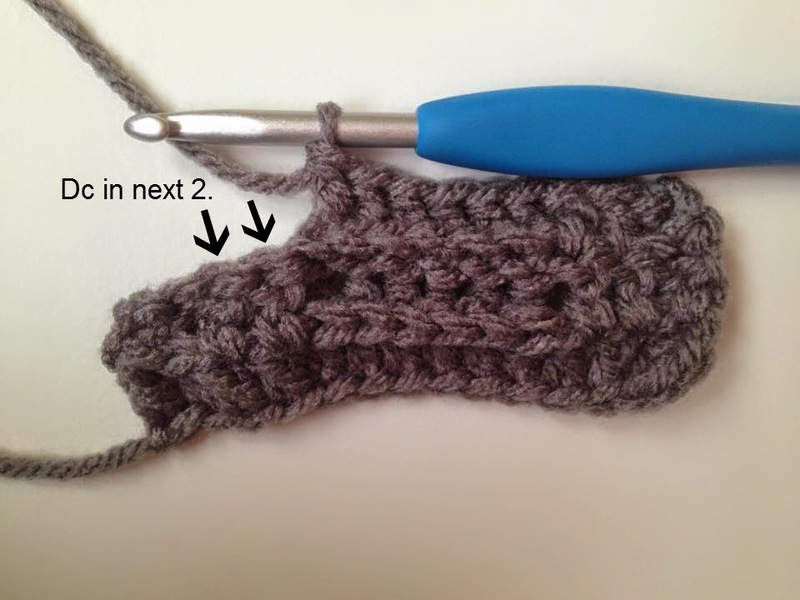 I love your pattern, I also decided since i hate crocheting around to do a foundation chain or something like that instead of the ch2 and it makes the edges a bit neater. Row 4: Sk first, fpdc around next, dc in next, dc2tog, sk 2, fptr around next 3. Fptr around the same space your dc2tog ended in, fptr around 2nd skipped, fptr around 3rd skipped. Starting in the same space as your 3rd made fptr; dc2tog, Dc in next, fpdc around next, dc in last. Ch 2, turn. If you can understand that then it may help! Sorry, it's a really difficult thing to write out in words which is why I never made it part of the pattern. 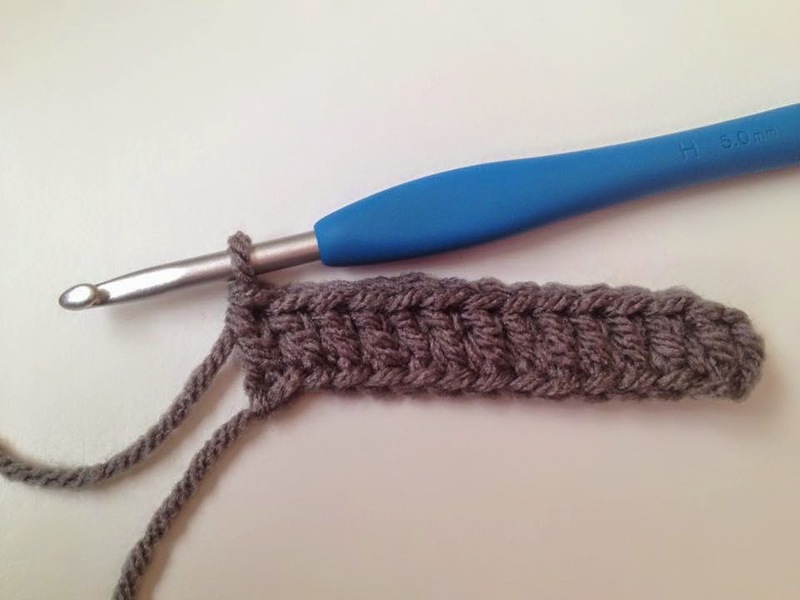 You could also try going down a crochet hook size if you are crocheting loosely but you may have to extend the pattern by a few rows. Hi! It was a piece of cake following this pattern! 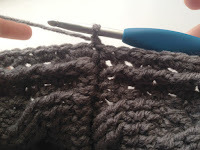 However, I am having trouble with the edging. My edges don't really look like dc and chains. It kind of just looks like evenly distributed gaps and blobs? Do I sc two in the gaps and sc 1 in the blobs? Also, every other "blob" doesn't have top two strands to hook.. I'm sure I followed the pattern perfectly, just having trouble identifying the dc's and ch 2's. Great pattern! Thank so much for sharing! I love your description of the ch 2's & dc's! I agree, it's about impossible to tell the difference between the ch 2's & dc's. But to answer your question: Do I sc two in the gaps and sc 1 in the blobs? Yes, you should end with about 72 sc. It turned out way better than I thought haha. Looks perfect! Thanks so much! I'm so glad to hear that! You're welcome! Thank you so much for this pattern! I bought a celtic weave pattern from ravelry, and when I couldn't figure it out, I went to Youtube, where I found your video! Thank you for clearly explaining this! Once I finish this, I may actually be able to do the celtic wave! I have a question, I'm left handed and absolutely cannot get this to look right. The section after you create the swirl, your going right to left and I'm going left to right. Is this what's making the pattern look flat? Hi Tanya, the row after the cable twists definitely does help it lay flat. 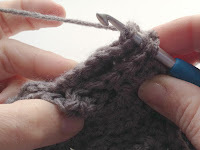 I wish I could crochet left handed so I could be of more help! Yeah the row after does make it look flat but since im going left to right it takes away the swirl completely and just makes it look like a flat bar going through the piece. Ill keep trying! What a beautiful pattern! And lovely tutorials. Thanks so much! I'll be making a few of them! Thanks so much for the gorgeous pattern! I'll be making a few! You put a lot of work into it. You're welcome Laura and thank you so much for all your nice comments! Thanks for this great pattern. 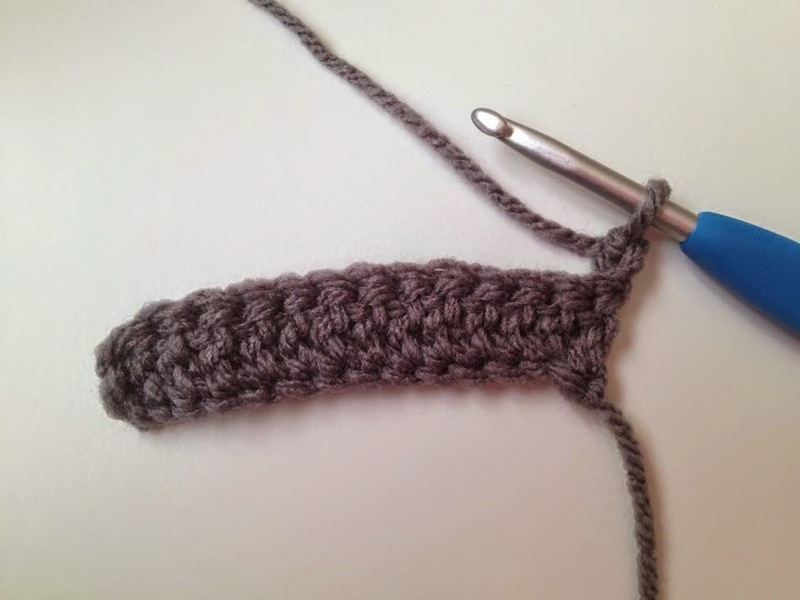 I just started a year ago to knit and crochet so I consider myself as a beginner. OMG I am absolutely in love with this pattern! Thank you so much! I believe this is the BEST pattern I have ever followed. You should be a pattern editor, you could retire!! Thank you!! 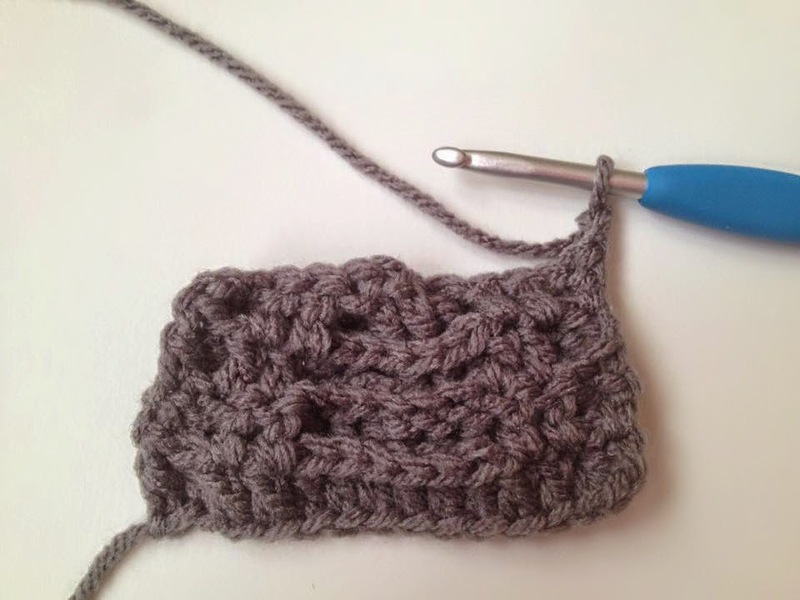 Thank you 😊 for the cable slouch beanie pattern. I was able to finished it but haven't posted pictures yet. Thank you so much for this pattern! The YouTube tutorial helped me so much! I can't wait to finish the headband for my mom for Christmas! Great pattern. I enjoyed making it and will make it again. 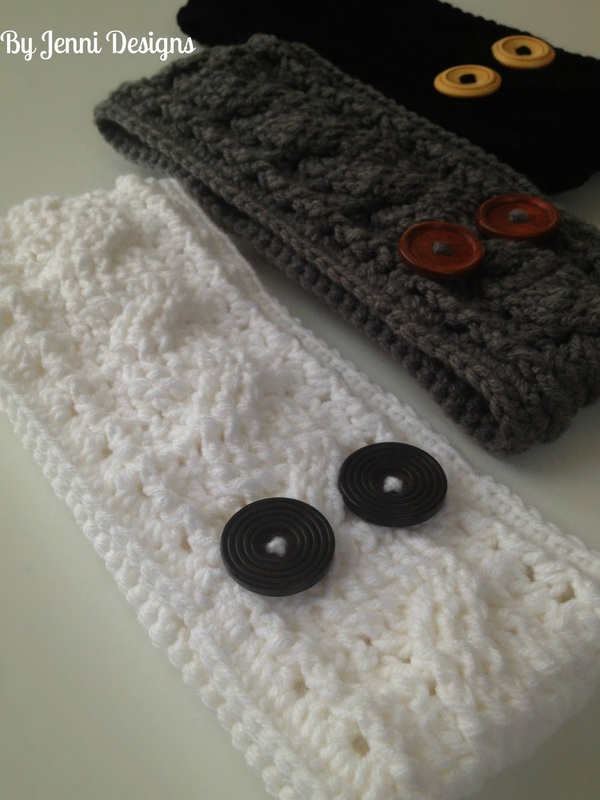 Hi Jenny, love your pattern, i made 1 for myself and it looks great, thank you!